The HTML Editor integrates with all Connect tools that have HTML content creation capabilities. For example, the HTML Editor is available when you edit discussion topics, create custom instructions for assignment folders, and create content topics. The Graphical Equation Editor enables users to insert mathematical equations within the HTML Editor. It supports the input of MathML and LaTeX, and includes a graphical editor where you can visually create equations. Depending on your org settings, you may not have access to all input methods. The Graphical Equation Editor in Connect does not require Java support or have specific browser compatibility considerations. MathML is a standard adopted by the World Wide Web Consortium (W3C). It uses XML to describe mathematical notation by capturing both its structure and content. This enables MathML to support visual display and assistive technology access. Go to http://www.mathjax.org to learn more about MathJax features. LaTeX is a typesetting system based on TeX. It provides a text syntax for complex mathematical formulae. Connect stores equations entered in LaTeX format as MathML to ensure consistency and accessibility. Add a template for building equations. Navigate to the HTML Editor where you want to create an equation. To insert a graphical equation, click Graphical equation. To insert a MathML equation, click MathML equation. To insert a LaTeX equation, click LaTeX equation. In the Insert Equation window, enter your equation. Navigate to the unit item that contains the equation you want to edit. From the context menu of the unit item, click Edit HTML. Inside the HTML Editor, click on the box with the capital sigma sign. To edit the equation using the graphical equation format, click Graphical equation. To edit the equation using the MathML equation format, click MathML equation. 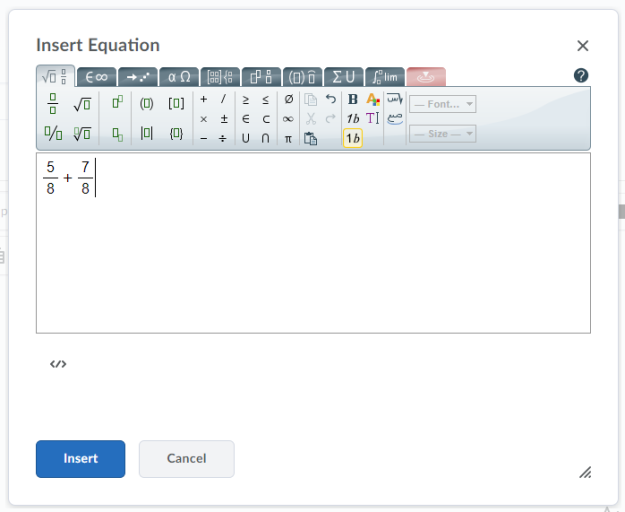 To edit the equation using the LaTeX equation format, click LaTeX equation.